Yesterday, in Rome, a man started shooting with a gun. He wanted to hit some of our politicians, but he ended up seriously wounding a policeman instead. We cannot do anything to stop those acts but we go on, carrying a message with our words and our music: here, in the XXIst century, we want to believe that mankind can work to build a future where you can always find a way to talk things out, where violence is NEVER the right path to follow. Thus, we jump again in our little time machine and we go back to the year 1914 to continue with our example of how things like that one can ignite something far more horrible. 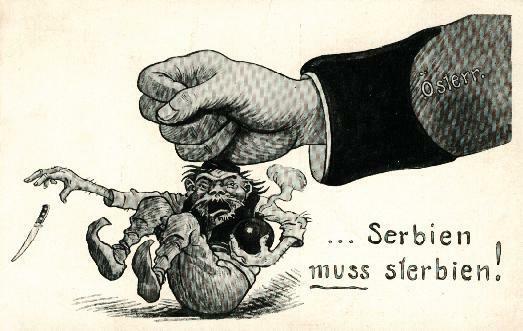 Soon after the assassination of Archduke Franz Ferdinand, Austria-Hungary sent a letter to Serbia. Well, more than a simple letter, it was a full fledged ultimatum. Serbia accepted it just partially and started mobilizing its army. Austria-Hungary, then, declared war to Serbia. During the last decades of the 19th century, all of the european countries had signed various treaties about mutual military support in case a conflict should occur, so this war declaration obliged everyone to set foot on the battlefield. While the Austro-Hungarians started the invasion of Serbia, the Germans invaded neutral Belgium and Luxembourg on their way to France. Due to this act, Britain declared war to Germany.In the meantime Russia was stopped in its invasion of East Prussia by the Germans and the Ottoman Empire joined the war opening up fronts in the Caucasus, Mesopotamia and the Sinai. Yes, this is another misleading post! Don’t get pissed off, on the next one we’re going to unveil the release date of our new single. If you successfully collected the clues in these posts and if you can guess the right date, drop us a line at band(@)futureistomorrow.it. You’ll receive the link to download “The Defeat” some hours before the rest of the world does!